We went with an LG. 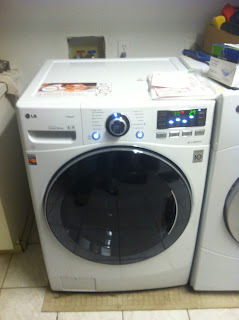 Our repair guy didn't love them, but comparing a bunch of washers at Home Depot one day, with a great sale going on, we decided to get the LG. Our old one started leaking recently. When we called out the repair guy, he found the two halves of the drum were warped slightly and under load (weight), the agitation cycle would cause leaking. Not a lot, but enough to be a problem. 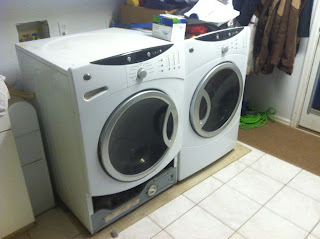 However replacing the drums was about $500-600 and since new washers are in the $600-1000 range, it didn't seem worth it. So we ordered one and delayed delivery until we were back from vacation. The guys came early this morning from Home Depot. We had the 8-12 window, but since we're out in the country, I guess they started here, calling at 7:45am to say they were coming. 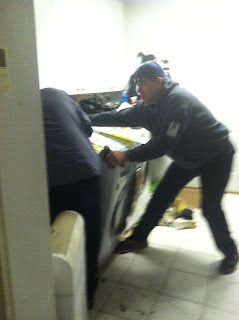 Arriving at 8:15, they pulled the old one out in about 5 minutes and then spent 10 installing the new one. It's a little smaller than our GE dryer, but not too much and it looks nice. A test cycle is underway, and then I'll get to the real testing: lots of dirty clothes.